Casey Mchone waits outside McKenzie Arena for a campaign rally with President Donald Trump on Sunday in Chattanooga, Tennessee. Mchone arrived at the arena at 6:30 a.m. for the 7 p.m. rally. But on the cusp of Tuesday’s vote, many Democrats are as anxious as they are hopeful. “Part of what’s at stake here is our ability to send a message that this is not who we are,” said Karen Finney, a Democratic consultant who worked on Hillary Clinton’s losing 2016 campaign. This year, history is on Democrats’ side. The sitting president’s party often losing ground in the first midterm after winning office, and for much of 2018, voter enthusiasm and polling has favored Democrats as well. Democrats’ focus is largely on snatching back the House and picking up governors’ seats in Florida, Wisconsin, Ohio and elsewhere. The party is also seeking redemption in the Midwest where Trump won over white, working-class voters who had backed Democrats for years. In Michigan, Ohio, Wisconsin and Pennsylvania, Democrats appear poised to regain ground. Such victories would build momentum behind the party’s shift toward a new generation of candidates who are younger, more diverse, with greater numbers of women and more liberal than Democratic leadership. They would also signal that Trump’s hard-line positions on immigration and his penchant for personal attacks turn off more voters than they energize. Even with his daily airing of grievances on Twitter and an approval rate below the average for his recent predecessors at this point, he has almost single-handedly put Republicans in a stronger position this fall. He’s aggressively appealed to his loyal, core supporters with a sharply anti-immigrant, nationalist message and by casting Democrats as outside the mainstream. “A vote for any Democrat this November is a vote to really put extreme far left politicians in charge of Congress and to destroy your jobs, slash your incomes, undermine your safety and put illegal aliens before American citizens,” Trump said during a rally Saturday in Pensacola, Florida. “I’m concerned that if the election is not what we hoped for that people will say, ‘it’s too hard’ and become disengaged,” said Jennifer Palmieri, who served as Clinton’s communications director during the 2016 campaign. In Southern California, lifelong Democrat Theresa Hunter said she didn’t take Trump seriously in 2016. But she sees a chance for Democrats to render their judgment on the president by pushing his party out of power in a different branch of government. 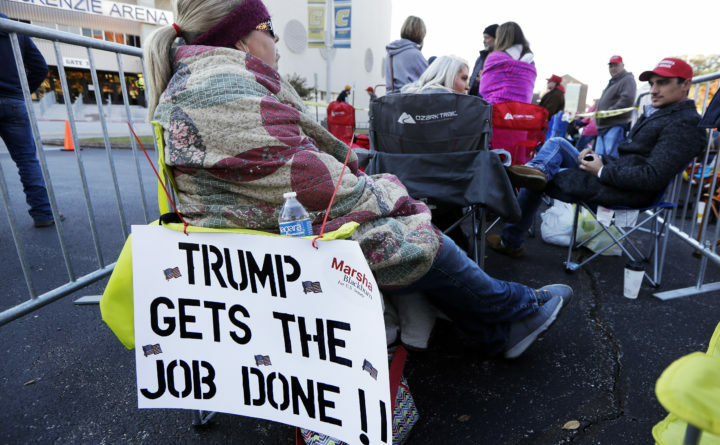 “To see his party jump on board and march in lockstep is what’s terrifying,” said Hunter, a 65-year-old retired salesperson from Lake Forest, California. “If we don’t make any progress in this election, I don’t know where we’ll go from here,” Reh said. Associated Press writers Jocelyn Gecker and Amy Taxin contributed to this report.